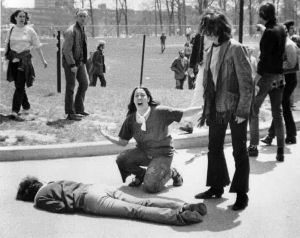 My visit to Kent, Ohio for the 40thanniversary of the Kent State killings, when four students were killed (Allison Krause, Jeffrey Miller, Sandy Scheuer, William Schroeder) and nine injured (with Dean Kahler left paralyzed and in a wheelchair for the last 40 years) was both nostalgic and informative. Although I was not on campus the day of the killings, I did see the burning of the ROTC building and the shattered bank windows over that weekend in downtown Kent. I also saw the Ohio National Guard occupy my campus, the FBI invade student dormitories looking for weapons and photograph classrooms to see what appeared on blackboards that May 4 morning which might have incited students to “riot,” the indictment of 24 students and one faculty member, and the exoneration of the Ohio National Guard and its leaders for any guilt in the killings. However, it was the town-gown hostility that mostly affected me. About a month after the killings, six townspeople attacked me, badly beat me, and repeatedly kicked me in the head. I reported this event to the police over the phone, but when I later checked to see what would appear in the local Kent newspaper, I was told, “Townsperson beat up by six hippie-types,” a reversal of truth that made me question every civil rights or anti-war “riot” I had ever read about. What first struck me was how many events were scheduled around this weekend: a two day student resistance conference, art exhibitions of May 4 events, a new film called Fire in the Heartland, an old documentary on May 4 made by a KSU professor, a panel of reporters who were on the Kent State campus 40 years ago talking about how the media shaped perceptions of the killings and the aftermath, and sessions on how May 4 shaped people’s lives. Unlike the first ten years after the killings, when the university either tried to cover up the event (by building a gym over the site of the shootings) or by denying the brutality of the slayings (the administration rejected a sculpture depicting Abraham killing his son Isaac), 40 years later was openly and honestly acknowledging the legacy of May 4, 1970 and honoring its memories by making Kent State a National Historical Site with an official walking tour and May 4 Visitor Center. Two events from this weekend particularly impressed me. The first was the play May 4th Voices which faculty member David Hassler wrote by choosing verbatim quotes from 1200 pages of oral history compiled by the university library archivist. The play was performed by a student class and depicted the May 1-4, 1970 events from multiple perspectives (The National Guard’s exhaustion after coming from a week long truckers’ strike, a townsperson declaring that “they should have killed more students,” Governor Rhodes calling the students “worse than brown shirts and the communist element and . . . the strongest, well-trained, militant revolutionary group that has ever assembled in America” and insensitive and irate parents saying, “the students shouldn’t have been there in the first place.”) The second was a new documentary called Fire in the Heartlandwhich explained the political activities at Kent State the years before 1970, the unity of the Black United Students as they led an unprecedented walkout supporting Black students who took over an administration building demanding a Black Studies program, and a large Students for a Democratic Society group. The documentary also extensively discusses the killings of the Jackson State students ten days later, which both then and now gets very little media attention in comparison to Kent State. A noticeable flaw in the weekend was an absence of any connection between the politics and student involvement of 1970 and 2010. When connections to 2010 did occur, they were outside of the official program and seemed superficial and ignored. At the end of a fine talk by Representative John Lewis called “Coming Full Circle: Democracy, Engagement and Social Change,” a New York City school teacher in the audience came to the open microphone and asked Representative Lewis to give Michelle Obama a letter for the President explaining the decimation recent financial events, school privatization and charter schools were doing to her students in the Bronx. The audience response was derisive dismissal. One of the speakers at the two-hour commemorative ceremonies made connections between Vietnam and our current wars but by then the crowd was thinning and interest waning. I would have welcomed a workshop or panel along the lines of “Vietnam Then—Iraq, Afghanistan, Pakistan Now” but it was not built into the program. With this lack of comparative political analysis, the weekend felt like a political time capsule, totally inclusive of May 4, 1970 but mostly ignoring May 4, 2010. The commemorative t-shirt’s quotation from Allison Krause (“History must be made relevant to the present to make it useful”) and the weekend’s theme, “Remember the Past, Shape the Future” both seem to have been ignored in the official program. In this case, the personal definitely was not the political.